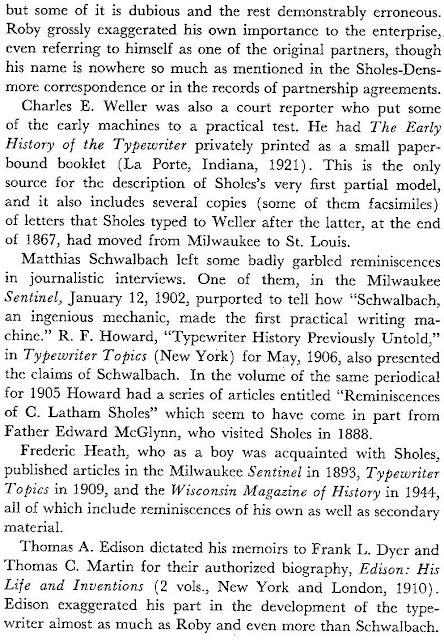 In the meantime, Charles Volney Oden’s Evolution of the Typewriter (1917) and Charles Edward Weller’s The Early History of the Typewriter (1919) remain in the public domain and are easily accessible online. 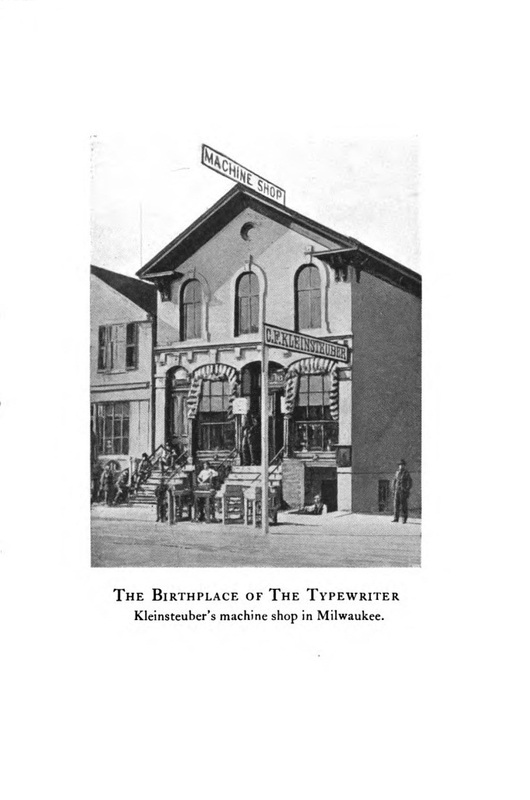 However, print-on-demand softcover editions are available from Nabu Press at massively inflated prices. 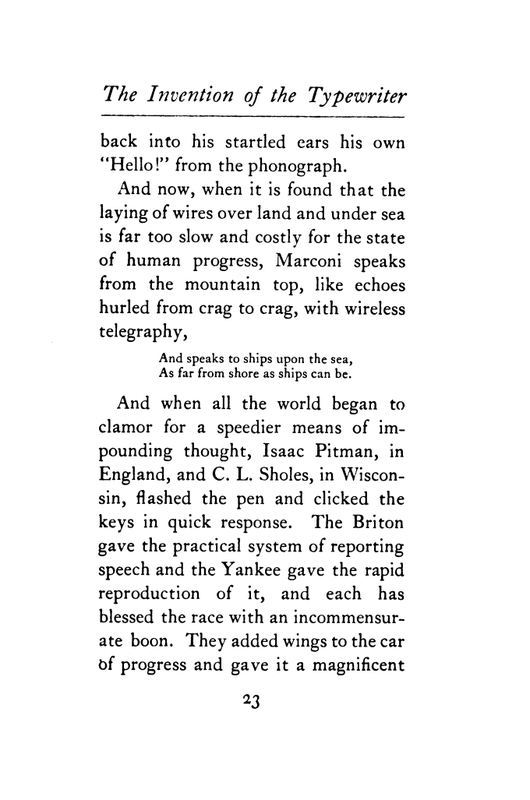 Nabu is an imprint of the historical reprints publisher BiblioLife, based in Charleston, South Carolina, and owned by BiblioLabs LLC. 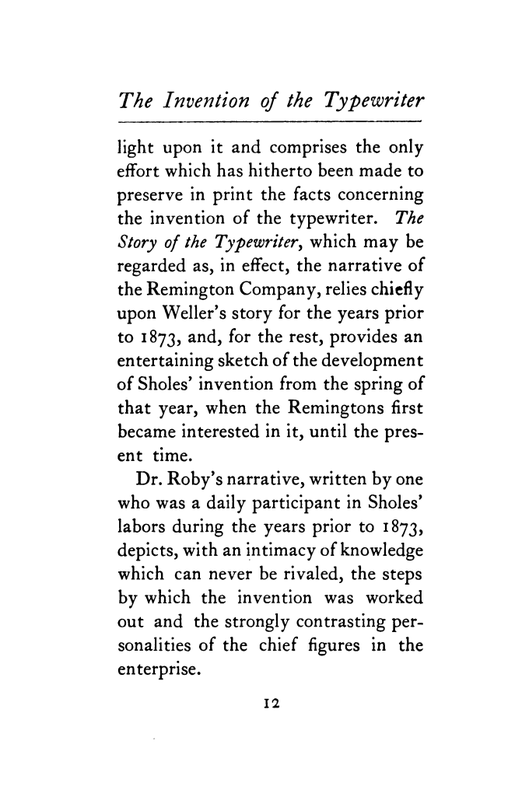 One typewriter history book which has not, to the best of my knowledge, ever been republished is Henry Wesley Roby’s Story of the Invention of the Typewriters. 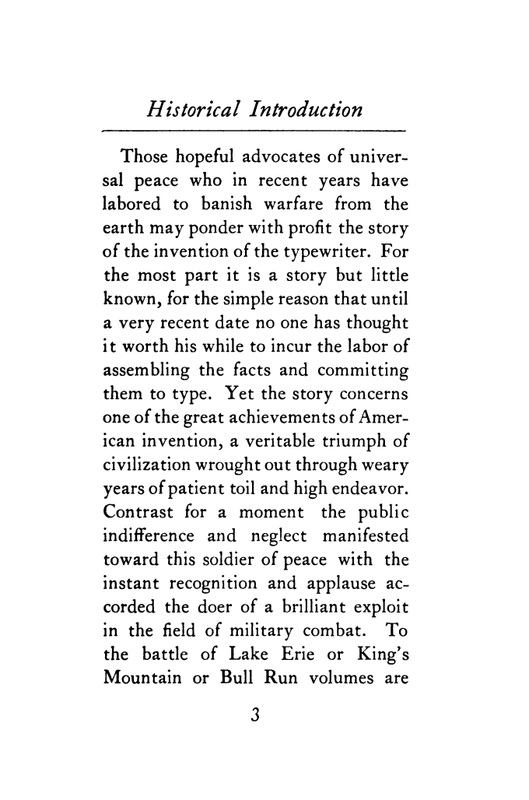 It was written in 1905 and edited for publication by Milo Milton Quaife in 1925, following the Herkimer County Historical Society’s The Story of the Typewriter (1923). 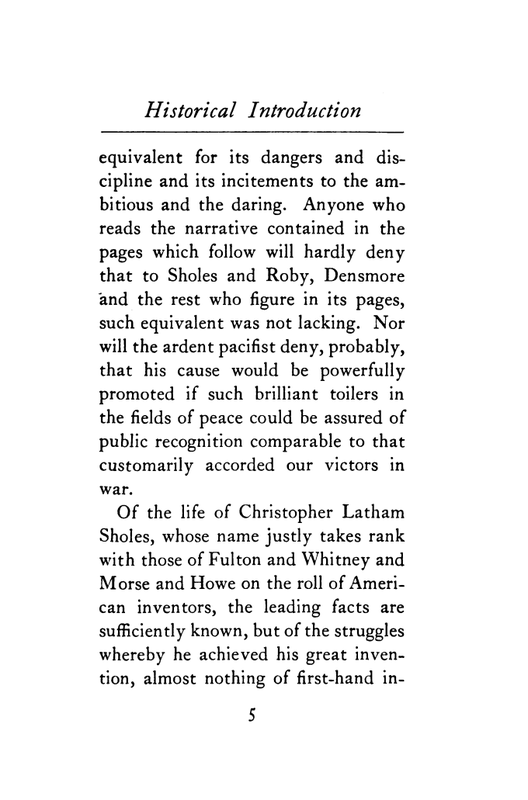 Perhaps the main reason Dr Roby’s book has been neglected is that latter-day historians are largely discredited it – particularly on the grounds of Roby’s claims of a role in the invention of the Sholes & Glidden. 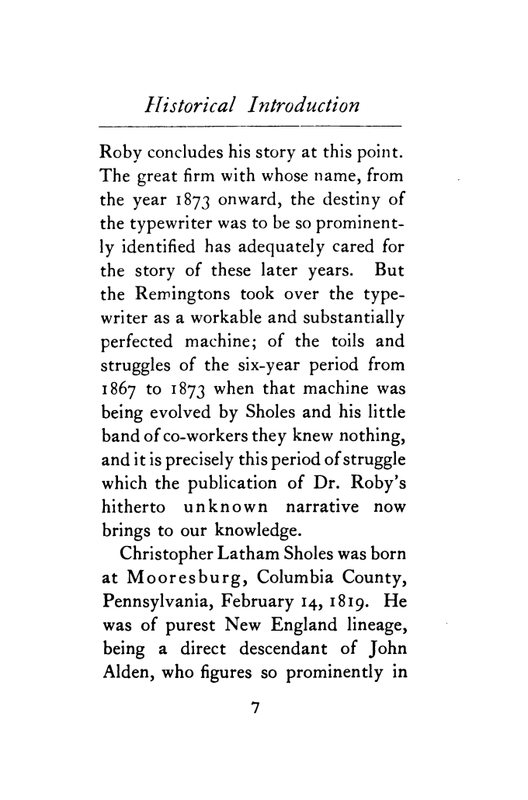 Nonetheless Current, possibly the most balanced of all typewriter historians, wrote “much of Roby’s account is indispensable” ... some of it dubious and the rest wrong. 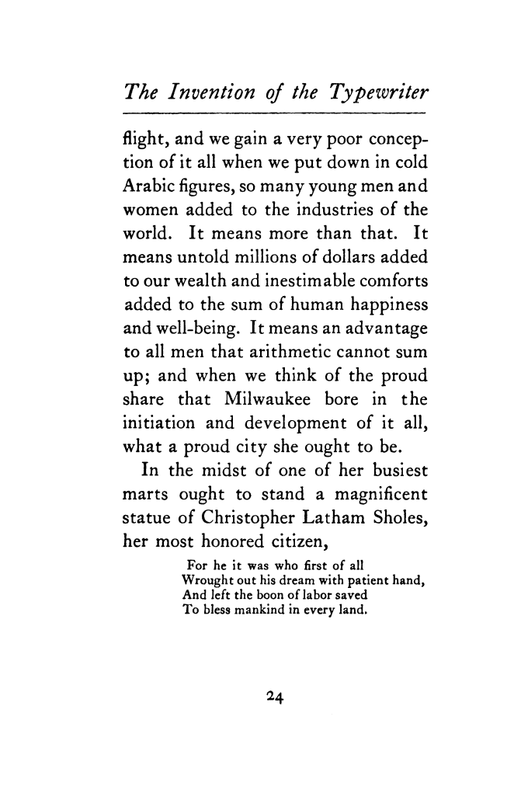 We can only guess at the breakdown: “Much” 75 per cent? “Some” 20 per cent; “Wrong” 5 per cent? 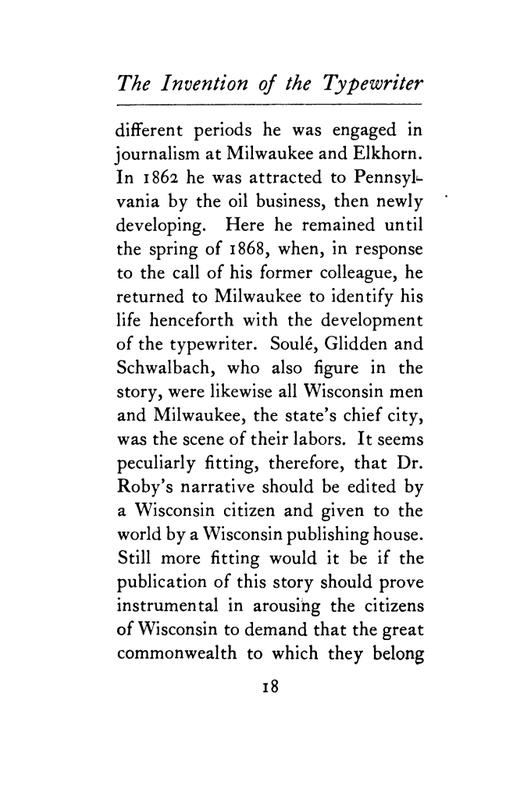 Michael Adler in Antique Typewriters: From Creed to QWERTY, wrote, “ … Roby, who with Oden was responsible for the perpetuation of so many myths surrounding the early days of the Type Writer …” Yet Adler was only too willing to quote Roby when it suited his argument. 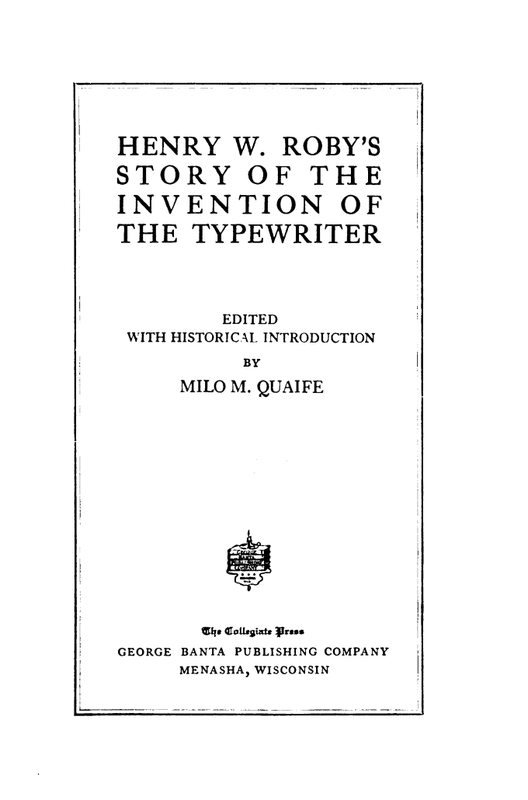 Bearing all that in mind, I have decided to reproduce Roby’s book here, if only because it is not so easy to obtain through other means. 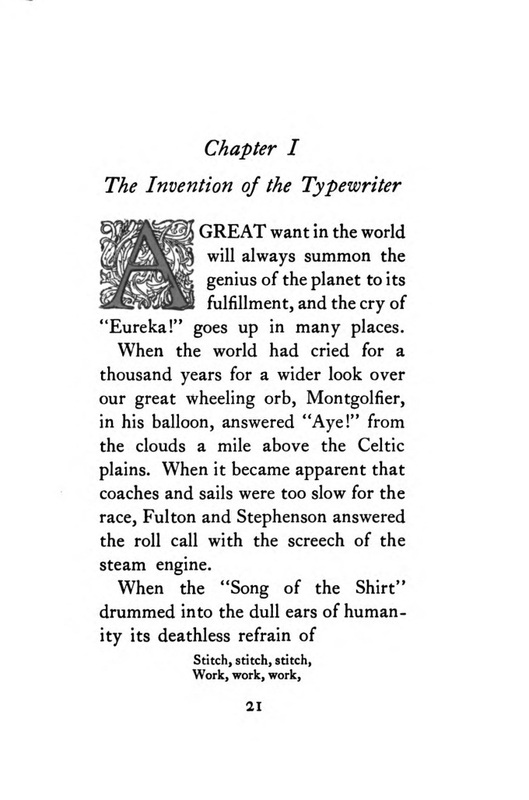 There will four instalments averaging about 30 pages in each. 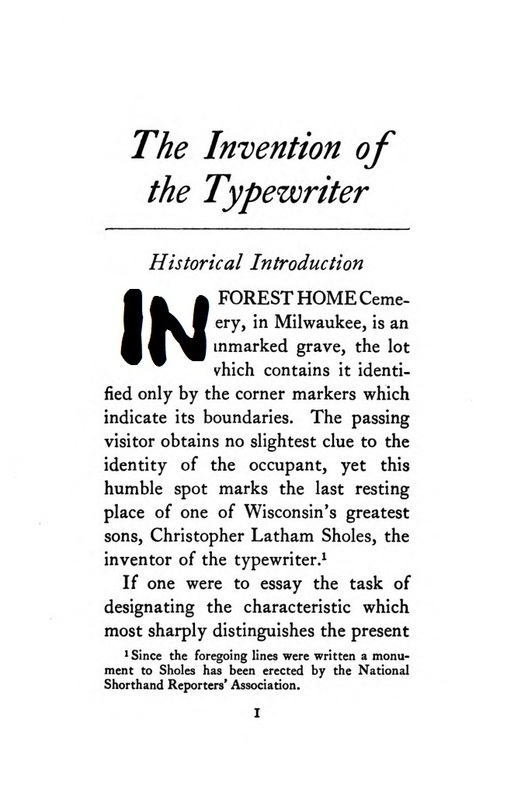 The reader is invited to make up his or her own mind on how accurate it is. 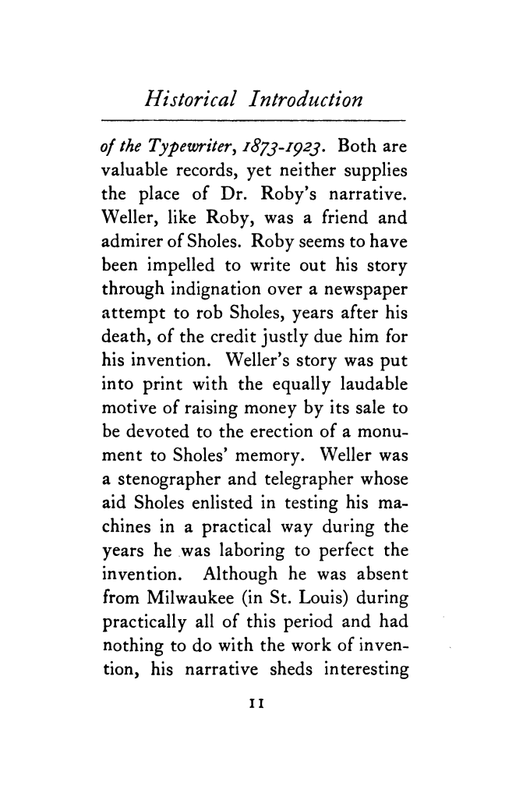 If Weller was republished, why not Roby? 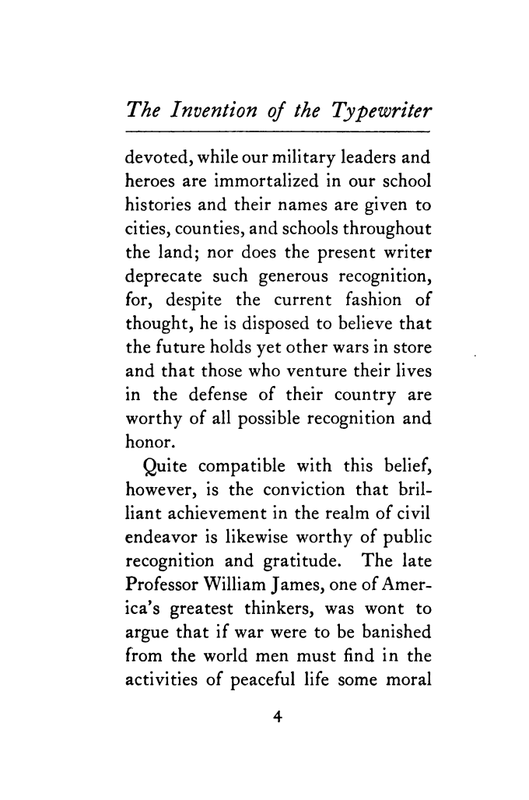 Weller's book was written in 1918, half a century after the events he described, and when he was 78. 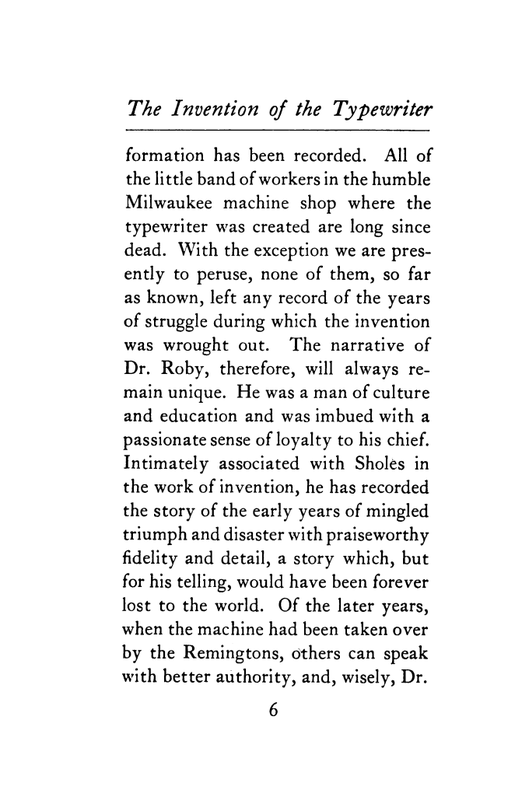 Roby's book was written in 1905, 37 years after the events in Milwaukee and when he was 63. 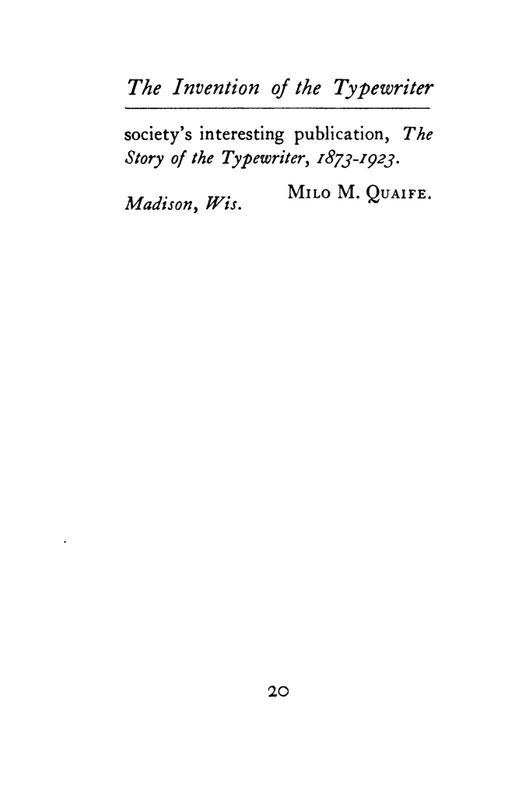 Could either be called a reliable memoir? 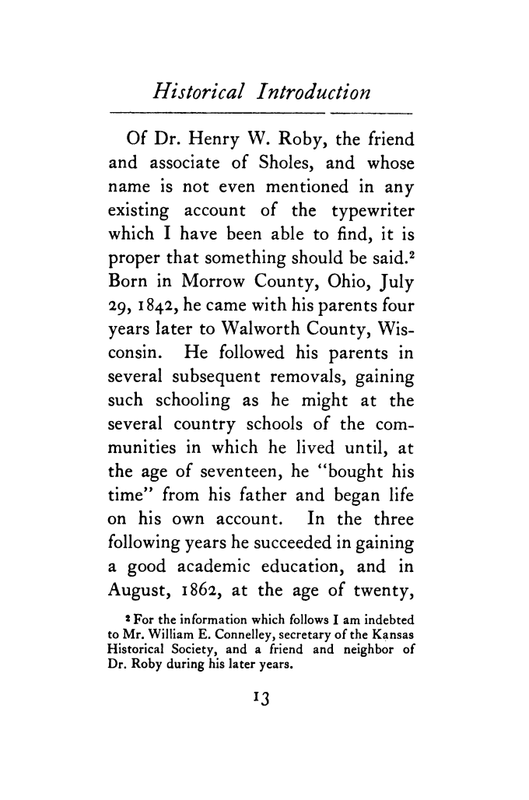 Henry Wesley Roby was born in Harmony, Morrow County, Ohio, on July 29, 1842. 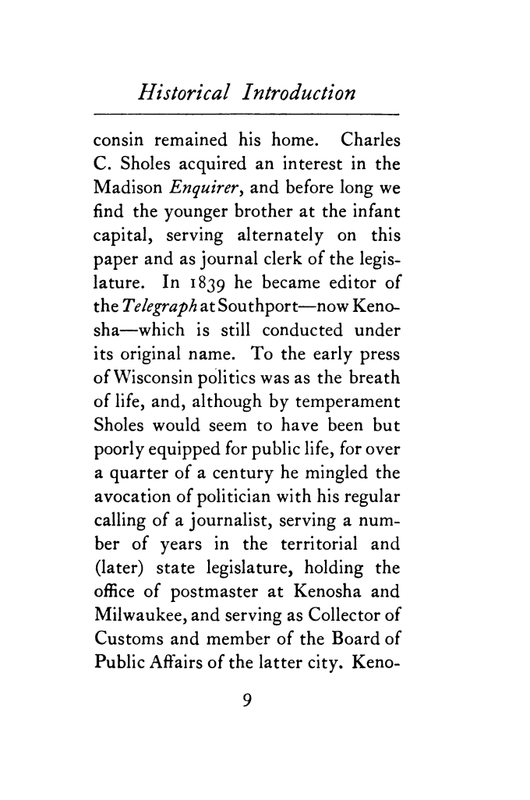 His father, with his family, removed to Wisconsin in 1846. 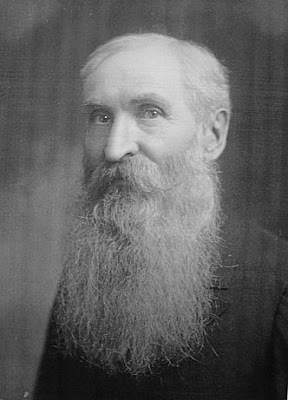 Henry enlisted as a private in Company K, Twenty-second Wisconsin Volunteer Infantry, in 1862, and remained in the service until 1865. During army service he studied phonetic shorthand writing and later worked for Bryant, Stratton & Co's Commercial College as a shorthand teacher. 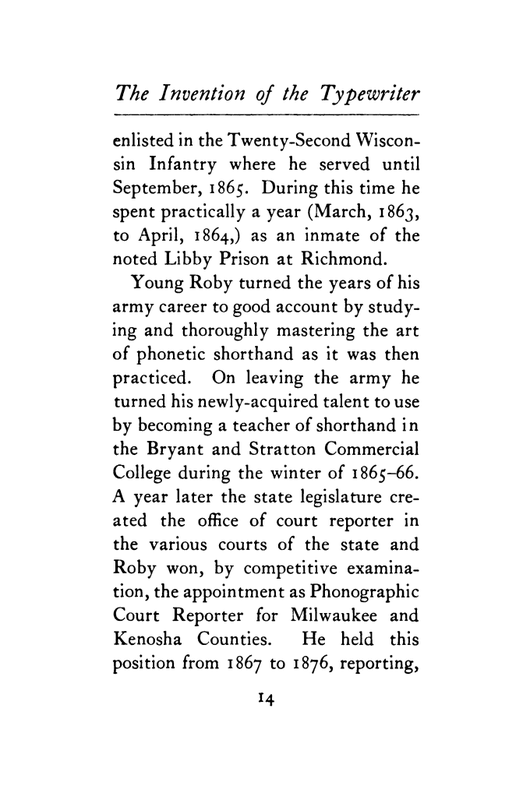 In 1867 Roby was appointed Official Phonographic Court Reporter for the counties of Milwaukee and Kenosha. 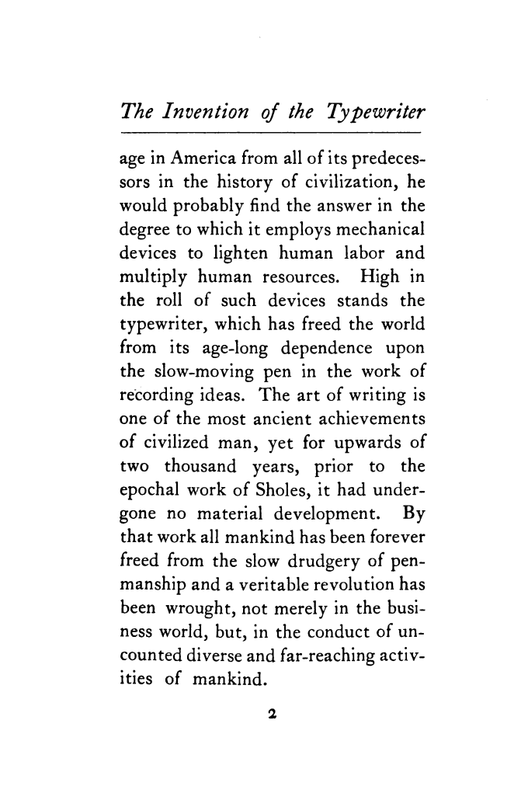 He held that position until 1876. 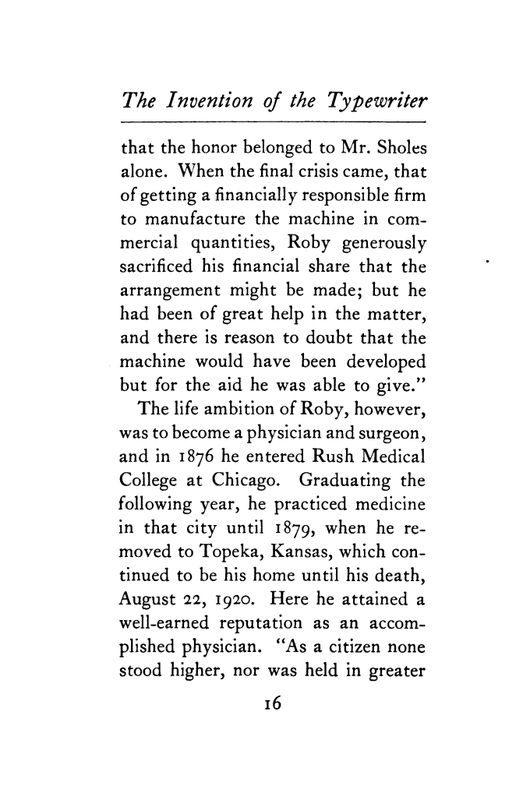 But from early boyhood his ambition had been to become a doctor, and in 1876 Roby entered Rush Medical College and later the Hahnemann Medical College of Chicago. 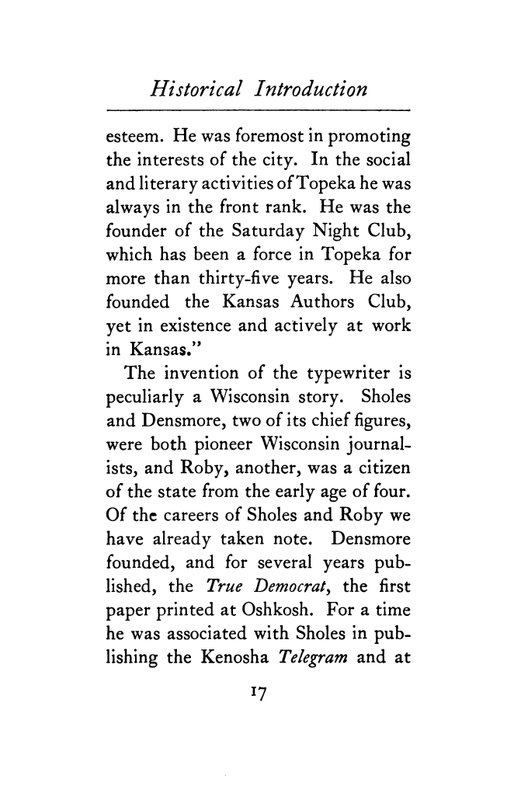 In 1879 he moved to Topeka. 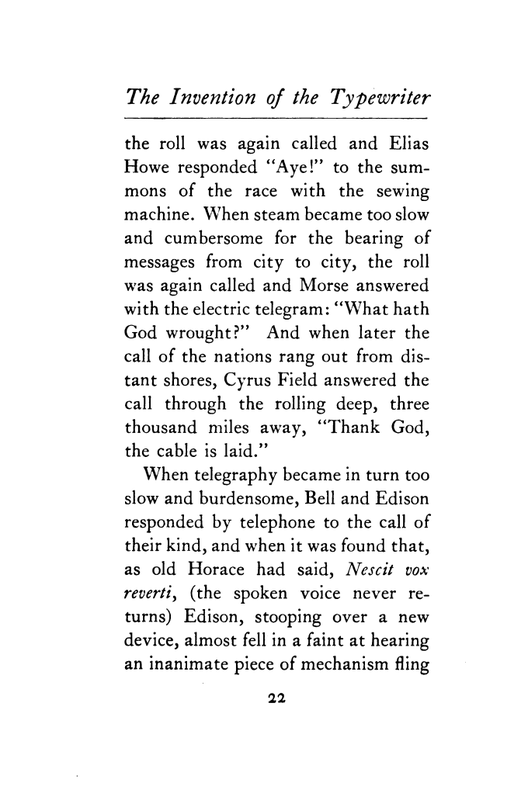 He died there on August 21, 1920, aged 78. 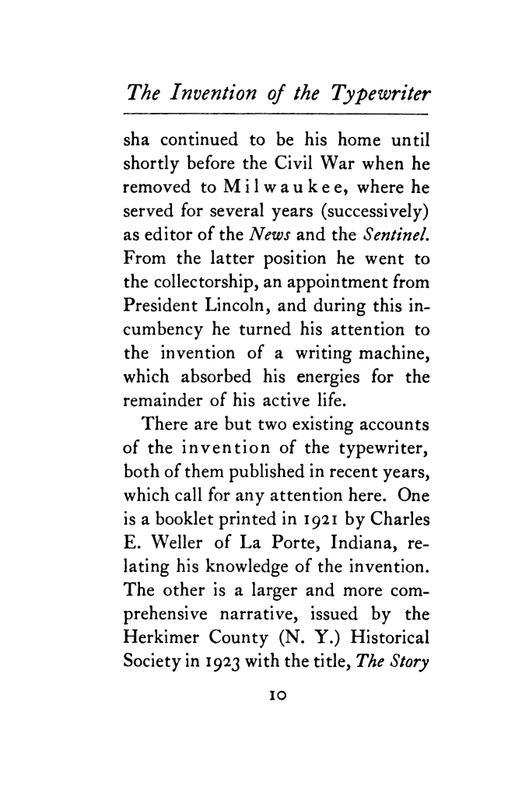 According to his obituary in the Topeka Daily Capital “he was involved in the invention of the Remington typewriter”. 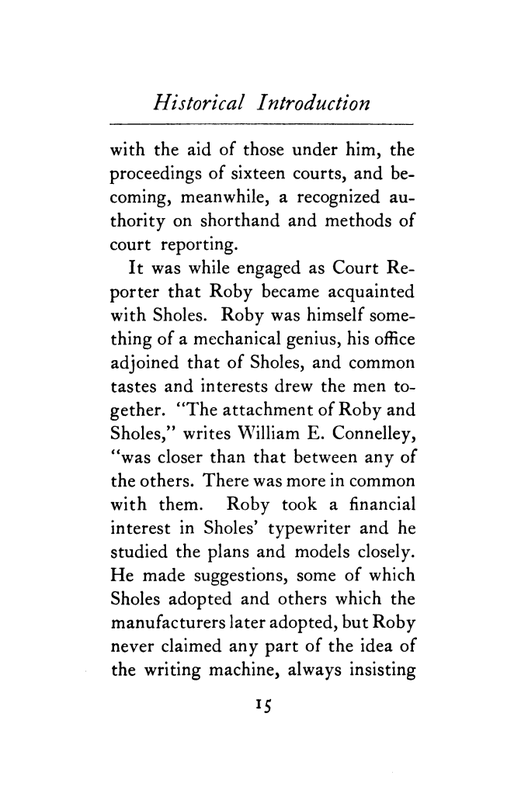 Robert, thank you very much for posting this informative article on Roby and Sholes. 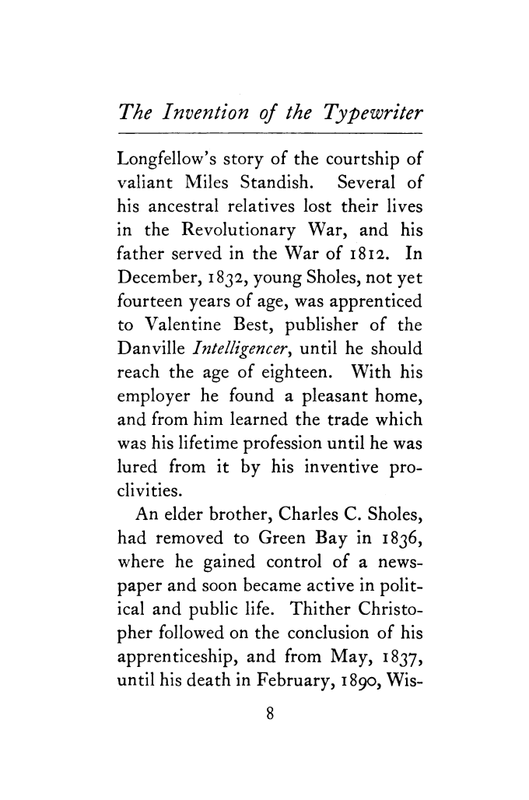 I have emailed the link to this post to the great-great-granddaughter of Sholes, who is a friend of mine living right here in Nevada County! 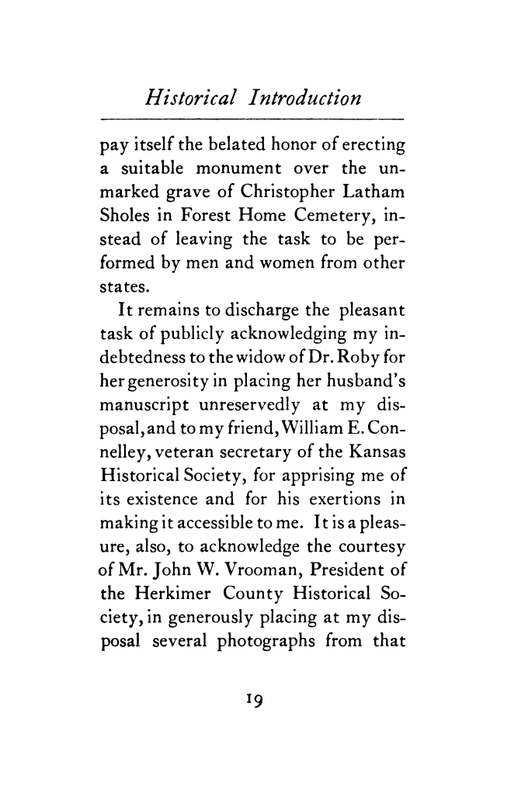 B. Ann Wilder is a lovely lady in her early 70s. 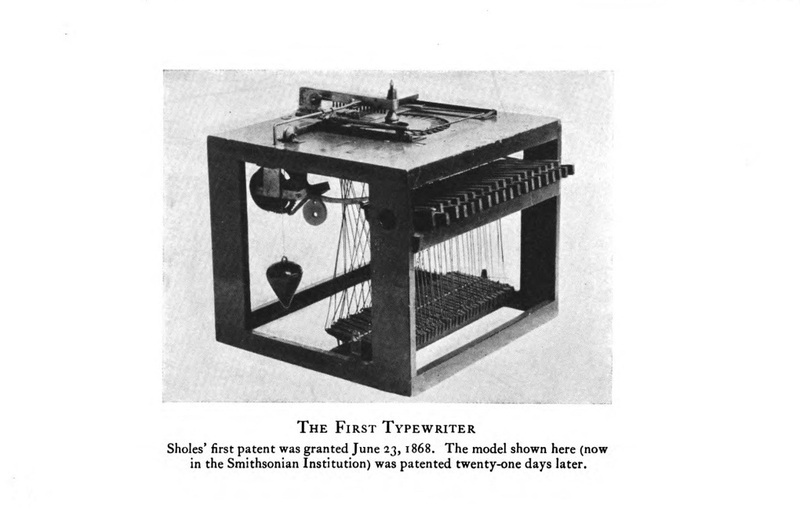 She was shocked when I knew Sholes' name when she happened to mention that her relative invented the typewriter. 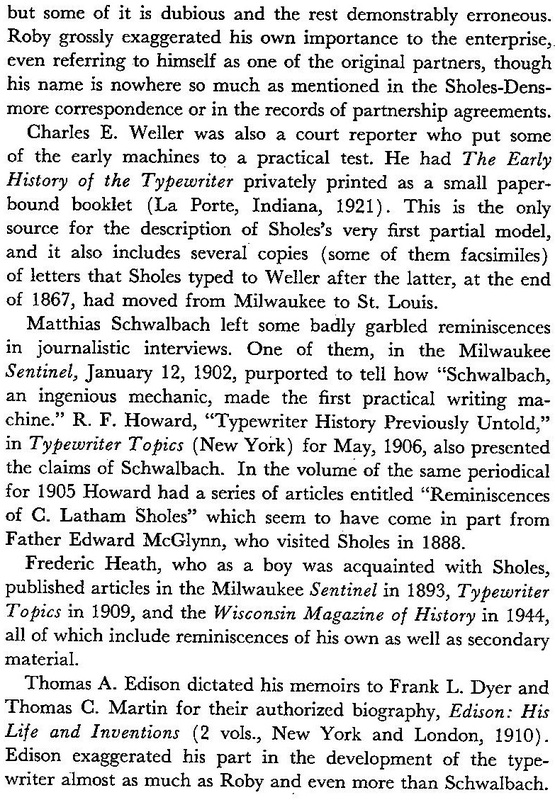 And I was shocked that she was Sholes' great-great-granddaughter!